My hubby and I are complete opposites. He’s an early riser; I’m a night owl. He’s generous; I’m frugal. He loves being in the spotlight and talking to people; I’m an introverted writer. You get the picture. ;) It’s a wonder we get along, but ironically and amazingly enough, the ways in which we are different are the very things that draw us to each other. We are like two magnets of opposite polarities that want—or better yet, need—the other person. This doesn’t mean we always appreciate one another. There’s been a lot of head-scratching moments during our marriage as we’ve learned how to adapt to and accept our differences. It’s taken me many years to understand him and why he does things the way he does, and vice versa. But by God’s grace, we’ve become better spouses as a result and no longer drive each other crazy (most of the time anyway!). Since I live the opposites attract trope in my marriage, I love incorporating it into my stories. I even included a real-life conflict that my hubby and I had over how to load the dishwasher in my book, Drawn to You. Sammie and Lucas are complete opposites; she’s a free-spirited artist and he’s a rule-abiding police officer. You can imagine the sparks that ignite between them! Lucas was learning a lot about the woman Sam had become, and perhaps she was right. He did have some misconceptions about her. Despite her unique taste in hairstyle and clothing, she had a lot going on inside of her that showed depth and—dare he say it—maturity. From what his mother-in-law told him, she demonstrated a great amount of patience in coaxing Lucy out of her shell. And her simple words earlier had reinstilled hope in his daughter’s heart. He couldn’t thank her enough. “One can never be too careful,” he quipped as he took them from her. “I heard that, Sammie Koo.” He gave her a pointed look as he picked up another handful of utensils from the sink before bending over the dishwasher. He took care in placing each fork, spoon and knife into different slots of the utensil holder. Crossing her arms over her halter top, she glared at him. “I didn’t say that. But, to be honest, my way is better.” He couldn’t help it. Goading Sam was not the most mature thing for him to do, but it was so enjoyable. And the way her cheeks flushed in annoyance made her look even more beautiful. Can’t you just feel the sparks? :) Sammie and Lucas are one of my favorite fictional couples, probably because they remind me so much of my hubby and me. Tell me, do you believe opposites attract? I’d love to hear what you think! I look forward to reading your answers. 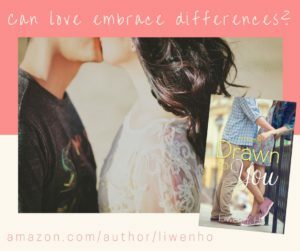 Giveaway: I’d like to give away one digital copy of Drawn to You. One winner will be randomly chosen from the comments below. The giveaway will remain open until midnight on Sunday, February 18th. My wife and I are opposites as well but I wouldn’t want it any other way. Being opposites we compliment each other and make each of us better people. Hope your book does well. Hi Mason! So nice to hear a man’s perspective here on the blog. :) Thanks for reading and commenting. Hi Liwen! Yes, I believe opposites attract. You already mentioned some differences. Another is neat and not so neat. Or living a simplified life or being a collector. Then there are food differences or arts vs. sports, choice of music. My husband likes Bach. While I enjoy classical musical, I prefer instrumental – no singing; plus more contemporary music. Nobody in our family sorts silverware like your husband. Another difference for silverware is handles down. My son does it that way, because his dishwasher fails to wash silverware well if silverware is crammed together in the basket. Marriage is a learning process of give and take. Nice discussion topic today. Thanks for the blog. Best wishes and Happy Valentine’s Day. Hi Renate! Oh boy, there are so many differences like you mentioned. I’m actually the one who sorts the silverware in our family (Lucas was based off me, haha). And I do handles down, too. ;) Happy Valentine’s Day to you, too! I can really relate to the dishwasher story! I would love to read your book! My hubby and I are the same! He’s a morning person and I’m a night owl, he’s the extrovert and I’m the introvert, he has a hard time sitting still and I love to sit and read or watch the world around me. We definitely fit each other perfectly and compliment each other’s missing pieces! I love it. Hubby’s the night owl, I’m the morning person (so long as it’s not too early!!!). We’re opposites in a lot of ways, but we’re both introverts, so neither is badgering the other to go out all the time. My husband and I are opposite in a lot of ways. We are able to make it work with the things we have in common our faith, family, and acceptance that neither is wrong, we just see things in a different way. Thanks for the excerpt! Sammy and Lucas are so fun together! what a wonderful post. my parents were so totally opposites. But they made their marriage work so well for over 50 years. My husbands parents were opposite I’m many ways and they had a great marriage also. My husband and I are opposite in some areas and so alike in other areas. We are making our marriage work also. Christ is the center and that is so what helps with all of these marriages. Oh, I am not interested in the e-book. I am just not reading my kindle much lately. So go ahead and give it to someone who will enjoy it now. I already have Drawn to You, so you don’t need to enter me into the drawing. I enjoyed reading it. My husband is like Tammy’s – he seldom puts anything in the dishwasher because I move things around just before I run it to fit the most in :-) I think he and I have more in common than not, although he is an early riser and I’m the night owl. Hi Margaret! :) It’s so fun to hear about these real-life dishwasher stories. Thanks for reading my books! There are many ways my husband and I are opposites as well. Over the years we’ve been married, we’ve learned to appreciate that in each other, it’s what makes us a complete person. Wouldn’t it be boring to be married/ dating someone who is just like you? I think I’d drive myself nuts if I had a husband who was exactly like me…lol! I also think being married for as long as I have, the petty stuff don’t matter much anymore. As I’ve learned to accept my husband as God made him, I’ve had a deeper love for him & it’s drawn us together even closer. I’ve learned to look for the good and disregard the bad (or irritating, etc) more. My husband has all the qualities I’ve prayed for and wanted in a spouse! This book sounds fun! I love opposites attract kind of stories, it makes for some interesting sparks for sure! Hi Trixi! Can I say amen to everything you said? :) I agree that it’d be crazy hard to be married to someone exactly like me. Lol. Thanks for commenting and sharing your experiences! Growing up my mom had a specific way that the dishwasher was to be loaded and as I’ve had occasion to be in other’s houses I find it interesting to see how differently they load their dishwasher. I’m definitely closer to Lucas than to Sammie. Hi Jessica! Yes, it’s funny how many people can relate to this dishwasher scene. I’m more of a Lucas myself. ;) Thanks for commenting! I do think opposites attract. I’ve seen some where they complement each other and then I have seen others who consistently bump heads. So my analysis, if it works, it’s wonderful, but it doesn’t matter if you are opposites or not, every marriage has to have a give and take attitude. But the most important thing for a beautiful marriage, is putting God first. Yes, opposites can attract. My parents are complete opposites and are together still after 58 years. I know other couples who are also opposites. I don’t think that that is the only factor involved in the lasting quality of their marriage. I believe they have both desired to put God first and themselves second, working at making their marriage honorable and glorifying to Him. Wow, what a beautiful example of lasting love that your parents have, Linda! Thanks for sharing.